When it comes to growing homegrown fruit, nothing could be easier than figs. Cultivated for thousands of years, figs have few demands on their caregivers. There are about 470 varieties of common figs — the ones we grow in the southeast. Their delectable fruit can be eaten fresh, preserved, or used in cakes and desserts like ice cream. Figs should be sited in a well-drained location in full sun. Figs should be sited in a well-drained location in full sun. They can grow into large trees or shrubs from 15 to 30 ft tall, but severe pruning can restrict them to a manageable height because they tend to grow wider than taller. Figs can be cultivated as edible shade trees, summertime screens, and espaliered or container-grown specimens. They do well in most parts of South Carolina except in the mountains. Figs will grow in many types of soils, but they need a site free of root-knot nematodes. In the colder areas of the state, the ideal site would be the south side of a building. Cold injury can be further reduced if the fig does not receive direct sunlight early in the morning or late in the evening during the winter months. However, the site should receive a minimum of 8 hours of sunlight daily during the growing season. Fig trees from nurseries may be sold bare-rooted or in containers. Since considerable confusion exists about fig variety names, order fig plants only from reputable southeastern nurseries. Never purchase or attempt to grow the kinds of figs grown in California. They require pollination by a tiny wasp that cannot survive under South Carolina’s climatic conditions. The only kinds recommended in South Carolina are the common types that produce only female flowers and set fruit without cross- pollination. See Table 1 for a list of suitable fig varieties for South Carolina. Fig trees are easy to propagate and a home planting can be started at very little expense. The simplest and easiest method of propagating figs is by digging up and transplanting suckers. Alternatively, take 8- to 10-inch long cuttings of one-year-old wood in early spring. Set the cuttings in a prepared bed so one or two buds on the tip are above the ground. Let them grow for a season before transplanting them. These cuttings root early, grow rapidly, and make good trees for permanent planting in the fall. Figs may also be propagated by mound layering. Root suckers emerging from below-ground can be separated from the parent bush and transplanted. Soil preparation should always include a preplant soil test. Adjust the pH and any other requirements based on the results of the test. Plant fig trees while they are dormant. In warm areas, bare-rooted trees can be set out in fall or early winter. In the mountains and piedmont, it is best to set them out in spring after the danger of hard winter freezes has passed. Container-grown plants can be planted later in the season than bare-root plants. Figs require little pruning — just enough to keep growth within bounds, to keep the crown open to sunlight and air, and to remove dead wood. Pruning should be done during the winter months, preferably after the coldest weather is past but before growth starts in the spring. Most fig cultivars bear two crops a year: a light one in early summer borne on previous season’s wood and the second crop in mid- or late summer borne on current season’s wood. Though fig plants can be trained to either a tree or a bush form, the tree form is not practical for the piedmont. In this region, fig plants are occasionally frozen back, making the tree form difficult to maintain. Begin training to bush form at time of planting by cutting off one-third of the young plant. This forces shoots to grow from the base of the plant. Let these shoots grow through the first season. Then, during the late winter after the first growing season, select three to eight vigorous, widely spaced shoots to serve as leaders. Remove all other shoots. Be sure the leaders are far enough apart to grow to 3 to 4 inches in diameter without crowding each other. If they are too close together, the leaders cannot grow thick enough to support themselves and their crop and tend to fall over or split off under stress of high winds. If this happens, remove the damaged leader and select a new one late the next winter by choosing one of the many suckers that arise annually. Beginning the second year after planting, if more branching is desired, head back the bush each spring after danger of frost is past but before growth has started. Do this by removing about one-third to one-half the length of the annual growth. Also, prune out all dead wood, and remove branches that interfere with growth of the leaders. Cut off low-growing lateral branches and all sucker growth that is not needed for replacement of broken leaders. Do not leave bare, unproductive stubs when you prune. These stubs are entry points for wood decay organisms. Make all pruning cuts back to a bud or branch. Fertilizing: Fig trees grow satisfactorily in moderately fertile soils without fertilizer. However, fertilizer is needed in soils of very low fertility or where competition from other plants is heavy. Use a fertilizer with an analysis of 8-8-8 or 10-10-10. For feeding plants one- to two-years-old, apply 1 oz of fertilizer each month from the beginning of growth through the end of July. Apply fertilizer to larger plants three times a year: early April, early June, and mid-July. Use ⅓ lb per ft of bush height per application. 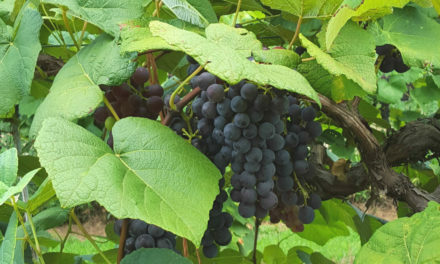 If the fruit are not reaching maturity and ripening properly, excess fertilizer or drought may be the problem and fertilization should be reduced. Increase the amount of fertilizer as the tree grows, up to 10 lb per year. Watering: For highest yields, figs need watering throughout the summer. The frequency and the amount of water depends to a large extent on the soil. As a rule of thumb, 1 inch of water per week from rain or irrigation is adequate. Yellowing and dropping of leaves may indicate drought. In lawns, the grass beneath fig plants may wilt in the heat while the rest of the lawn does not. This indicates the figs need water. Figs grown with lawn grasses may require one or more waterings a week during hot, dry periods. Winter injury in figs is directly related to the amount of vigor. A vigorous, fast-growing plant is easily killed by low winter temperatures in the piedmont. If figs are frequently cold-damaged in your area, reduce the fertilization recommendations by one-half. If you are attempting to grow figs near the mountains, no fertilizer should be applied to make the plants as cold hardy as possible. For plants one to two years old, apply ⅓ lb 10-10-10 fertilizer each month from the beginning of growth through the end of July. For a bush 12 to 15 ft tall, apply 4 lbs 10-10-10 in mid April, early June, and mid-July. For plants less than 12 ft in height, use about 1 lb 10-10-10 for each foot of height and split into three applications as given above. 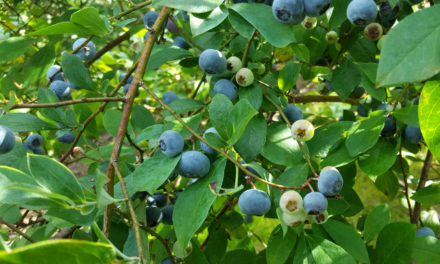 If the fruit are not reaching maturity and ripening properly, excess fertilizer or drought may be the problem and fertilization should be reduced. Young, vigorous plants will often produce figs that do not ripen. If the plants are excessively vigorous, stop fertilizing them. Quite often, it may be 3 or 4 years before the plant matures a crop because most figs have a long juvenile period before producing edible, quality fruit. Dry, hot periods, which may occur prior to ripening can result in poor fruit quality. If this is the case, mulching and supplemental watering during dry spells will reduce the problem. The ‘Celeste’ variety will often drop fruit prematurely in hot weather, regardless of how well the plants are cared for. However, it is still one of the best varieties for the lower part of the state. ‘Celeste’ is best for the piedmont because of its cold hardiness. An infestation of root-knot nematodes can possibly intensify the problem when conditions are as described in #2 and/or #3 above. Perhaps this particular fig requires cross-pollination by a special wasp, which is a rare problem. If this is the case, then it will never set a good crop. One way to resolve this is to replace the plant with a recommended variety from Table 1. Alternatively, propagate a shoot from a neighbor’s plant that produces a good crop each year. Root-knot nematodes are the primary pest of fig trees in the sandhills and coastal plain. An on-the-spot diagnosis of root-knot infection is possible. Dig up a few roots and look for the characteristic galling or swelling caused by the nematode. There is no other similar problem in figs. Root-knot Nematode: Infected fig trees cannot be cured with chemical treatment. Pruning back the top to balance it with the weakened root system and attentive watering and fertilization may prolong the life of a root-knot infected fig tree. Usually, however, they will die sooner or later regardless of the care they receive. When planting a new fig tree, select a site as far as possible from any old garden sites. Take a nematode sample in this site. If root-knot nematodes are present, do not plant figs. Fig Rust: This fungus attacks the leaves, usually in late summer. Severely infected leaves turn yellow-brown and drop. The underside of the fallen leaves will have numerous small, somewhat raised, reddish brown spots. These spots are often covered with a dusty golden-yellow mass of rust spores. Fig rust is usually not fatal, but repeated epidemics will weaken the plant. In any given year, heavy leaf drop from rust will reduce size and quality of the fruit. Unless fig rust is an annual problem, spraying is not warranted. Fig Fruit Souring: This is caused by yeasts that are spread by insects. Souring becomes noticeable as the figs begin to ripen. A souring fig will often show gas bubbles and/or scummy masses oozing from the eye. These figs will give off an offensive fermented odor. Souring cannot be controlled with chemical sprays. The only control is to grow fig cultivars that have a tight or closed eye that prevents insects from entering the fig fruit. Pink Blight: This is a fungus that appears as a dirty-white to pale pink velvety growth on dying and dead twigs. It usually occurs in the interior of the tree. Prune out infected branches and prune the tree to allow good air movement within the tree. Leaf Blight (Thread Blight): This is a fungal disease that attacks leaves and fruit. Infection may start as a semicircular brown spot at the base of the leaf. Some leaves shrivel and die while others may be covered with brown spots that break out to leave irregular holes. During hot, wet weather, leaves can die and drop very quickly. Dead leaves are often matted together and held to the tree by threadlike strands similar to spider webs. * “Although it tastes fine, the black-colored syrup may be unacceptable. Add lemon juice to the packing syrup to reduce the pH.” Paul Wilson, Ph.D., Food Processing Specialist, Horticulture Department, LSU, Baton Rouge, LA. Other cultivars that should be considered for landscape or container gardens are in the following Table 2. (excerpted with permission from W. H. Outlaw Jr. and N. N. Outlaw, 2001). These figs were exposed to 15 oF in January 1999 and damage and plant size were assessed in midsummer 1999. Fruiting was evaluated in 1999 and 2000. Only the five high-yielding cultivars are presented. 1Diameter was measured 4 in. above soil level. Height measured from soil level to the tip of the longest shoot. 2Dimensions refer to shoot diameter larger than which no cold damage was observed. 3+ = some fruit; ++ = much fruit. Source: “Experiment: Twenty potted fig cultivars on the Gulf Coast of the southern U.S.” by William H. Outlaw Jr. and Nedra N. Outlaw, The Fruit Gardener, California Rare Fruit Growers, Inc., July/August 2001, pp. 15-16.